Advanced Aviation has performed the Flight Test fort he FIRST C 208 Para Kit Hinge system - according POH Supplement S 8 - to bring an automatic released jumper in distress safely back into the aircraft. Our Cessna Caravans D-FLIP and D-FLIZ are certified for military automatic jumps now. The final testing took place on the 15.07.03 in Altenstadt – German Airborne School. Advanced Aviation has now the possibility to drop military Jumpers with their special Equipment with manually and automatic release Systems, either with square or round canopy parachutes. A special hinge retrieving system, designed by our Pilot and engineer Arnfried Neugebauer, makes it theoretically and practically possible, to rescue a jumper in trouble, remaining with his static line outside of the aircraft in flight! It might be possible that an automatic released jumper could remain on his static line outside the aircraft. Usually the proper procedure was to cut the static line and the jumper has to open the reserve parachute immediately to safe his life. In case that the jumper the jumper is injured, maybe under stress not able to react, we developed and established a hinge system to bring the jumper safely back into the aircraft. We explored the area of GOMA – EAST CONGO REGION close to the lake Kivu. This region is a civil war zone since years. Additionally, the 7 volcanoes around the Area are still active. The last big eruption was 2001. You can still see the results from this big eruption which causes a lot of additional problems for the local people. We checked the possibility for an development for a new operating concept on place together with our friends from KIVU Air. Advanced Aviation performed operational training and the annual check flights for the Cap Verde Coast Guard Pilots. 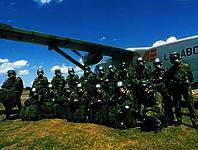 We are responsible for the military training and check flights for the Guarda Costeira Cabo Verde! All pilots on duty are trained by Advanced Aviation!